Daniel Belcher, Blythe Gaissert. All photo by Steve Di Bartolomeo. Georgia O’Keeffe broke the mold. A rare woman in the man’s world of painting, she pioneered idioms within the modernism genre and drew inspiration from the little known “Land of Enchantment” – New Mexico. Laura Kaminsky honors this great artist with her world premiere opera Today It Rains, commissioned and presented by Opera Parallèle. Rather than taking an epic sweep of O’Keeffe’s life, the composer and her librettists, Mark Campbell and Kimberly Reed, condense her portrait into a formative train trip from New York City to Santa Fe in May of 1929. This journey represents not only a geographic, social, and cultural shift from the epicenter of the American art world to the vast and desolate desert of the Southwest, but also O’Keeffe’s commitment to a new direction in her art which would immortalize her work. Perhaps as significantly, by leaving Alfred Steiglitz, her distinguished photographer husband, behind in New York, she charted an uncommon path of independence. The cleverness of the opera and this production comes through in a number of ways. Though nominally constrained to a railroad train and stations, the libretto uses flashbacks, adding historical context to the O’Keeffe-Stieglitz relationship, to understand the significance of the trip. A full back wall projection screen provides orienting shots of this great trek on rails and the change of landscapes going west. Although the content of the projections reflects the changing scenery as well as suggestions of O’Keefe’s art, the palette is subtle without strong contrast between the lush spring green of the East Coast and the bright skies and red mesas of New Mexico. Director Brian Staufenbiel and Scenic Designer Sean Riley’s staging is quite exciting. With 11 live scene changes in 80 minutes, props transitions take on greater significance than usual. In an ingenious solution to minimize the furniture needed, a number of pieces are convertible. For instance, the bed in a New York apartment becomes a chair, seats on the train, and also a space divider. The overall look in each scene is at once spare, yet fulfilling. Another challenge of open staging is the desire to maintain continuity during the changeovers. Thus, each scene change demands instrumental accompaniment from the score which times well with the choreographed shift. These interludes are written well and handled with aplomb. The score is written in the modern idiom and lacks memorable set pieces or 19th century melodiousness. What it does have is a strong sense of the progression of the rail trip, along with the special nature of time and opportunity for reflection that this type of travel uniquely engenders. Starting with the eerie opening of clinks and tocks and whines as the train leaves the station musically, it accelerates until yielding to the rhythmic undulations of the passing scenery – with the music embracing the movement. Motifs unfold along with a strong association of instrumentation with human and inanimate character, most conspicuously, the clarinet with the train conductor Aubrey Wells. To enhance the musical text, the composer borrows from other genres. Upon leaving Erie, a large sampling from Robert Schumann’s “Träumerei” (Dreaming) is played – appropriate to an overnight part of the trip. A jazz infused segment is introduced as the train reaches Chicago. In addition, a fiddling sequence honors O’Keeffe’s father who played the instrument. O’Keeffe is accompanied on the trip by her close friend Rebecca (Beck) Strand, and much of the story line is revealed through their activities and conversations. 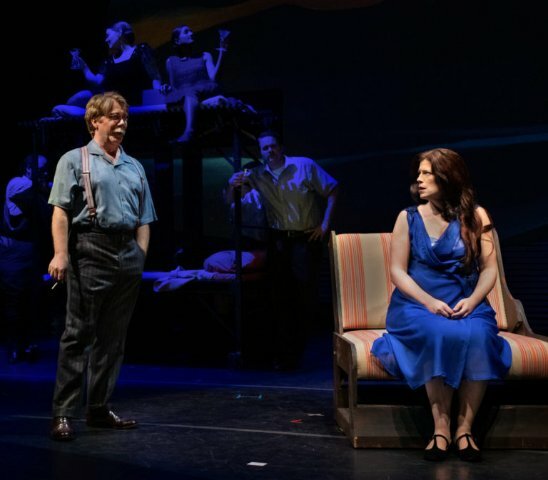 But the libretto is more a character study without major disquieting incidents rather than a dramatic narrative with sharp peaks and valleys. No soprano dies in this one. Instead, we learn about the inner Georgia O’Keeffe. Perceived by many as frigid and austere, her messages to Steiglitz portray a romantic and sensitive side. The love of her art is depicted through the attachment to a constant companion – her paint box. She discloses her appreciation of the emergent power of the tubes within by noting that each color is good alone, but that they work better when combined. Her aria to the paint box is in fact a love song. Dismissive of the sometimes fawning and sometimes skewering art critics and patrons in New York, she yearns to set her own course and to be accepted and have her work interpreted on the same plane as a man’s. Yet for all her courage and adventure, she approaches a new beginning with trepidation. The portrait is engaging and represents a fine operatic journey for the audience. As we have come to expect from Opera Parallèle, this production is innovative with excellent performance and production values. The four central performers command the stage and satisfy the ear. Interestingly, the lead couple’s voicings are for mezzo and baritone. Blythe Gaissert sings with power, warmth, and conviction as O’Keeffe while Daniel Belcher excels in a mellifluous deep bellow as Stieglitz. Soprano Marnie Breckenridge as Beck and tenor Nathan Granner as Aubrey provide crystalline vocalizations. Maestra Nichole Paiement conducts the chamber orchestra to its polished sound with energy and precision, finding a visual and aural expressiveness in the combining of the instruments, parallel to that of O’Keeffe combining her paints. Today It Rains composed by Laura Kaminsky with libretto by Mark Campbell and Kimberly Reed is produced by Opera Parallèle and plays at Z Space, 450 Florida St., San Francisco, CA through March 31, 2019.